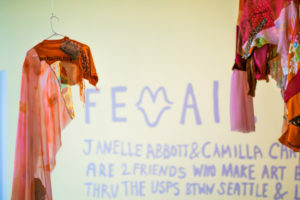 This past summer, Bellevue Arts Museum (BAM) presented AMPM (2.0), an exhibition by the Seattle and Los Angeles-based fashion collective: FEMAIL. 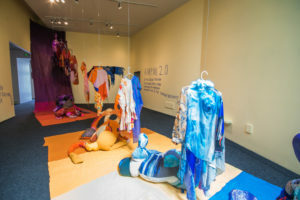 The show–which ran June 1st to September 30th, 2018–featured garments, textiles, childhood mementos, and keepsakes reinterpreted into new works of clothing, furniture, wall hangings, and sculpture. Collaborators Janelle Abbott and Camilla Carper work in their respective cities while mailing the works back and forth to one another. I was able to get up to Seattle for a day and check out this exhibit (as well as many others). 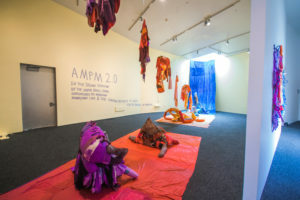 FEMAIL AMPM (2.0) installation, 2018. Photo: Emilie Smith. You’re first aware of FEMAIL’s presence at BAM when you enter onto the third floor and hear faint music in the background. As you get closer, the volume increases, and you begin to see brightly colored works and pale yellow walls peeking out from behind stark white walls and open doorways. As you enter the room, it’s both tiny and spacious–with not that much floor space, but very high walls and ceiling, and completely filled with vibrant works. The small changes of adding music and changing the wall color really brings you into an immersive world, in the most simplest way. 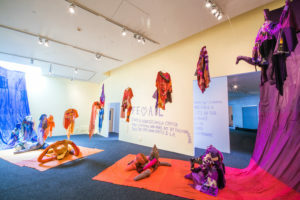 There are two large, swooping textiles that go from opposite corners of the room to the center, each with garments and sculptures placed on top. Works were arranged in a gradient representing transitions through periods of time, and how our identities are constantly deconstructed and recreated throughout our lives. The forms on the floor are much more sculptural–referencing human form, furniture, and animals. 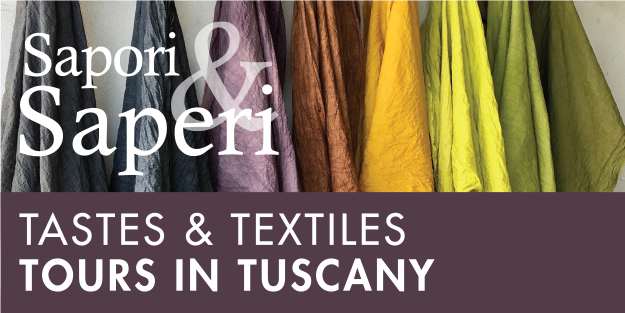 The swooping textiles also act as a nontraditional runway to spotlight the garments and pedestal to spotlight the sculptures. FEMAIL explores the concept of death as a necessity to rebirth into future forms of self. The collaborative and improvised way the works are created illustrate how things can physically shift and reform through death and rebirth. The formal elements utilized in the works echo Rebirth Garments and Rei Kawakubo’s Commes de Garcon. The works question the human form, our perceptions of it, and how it transforms over time. The materiality of the show is also quite fascinating. 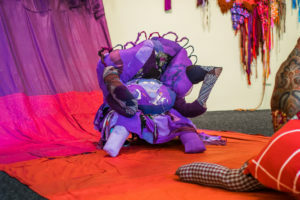 Each piece is made up of a myriad of materials–including sport apparel, embellishments, feathers, sequins, embroidery, patches, yarn, Ikea bag, towels, and so much more. 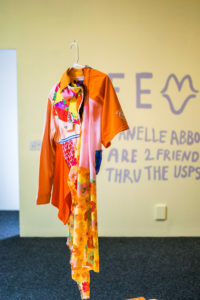 Despite living in different cities, Abbott and Carper are able to work together by mailing garments back and forth between Seattle, WA and Los Angeles, CA. 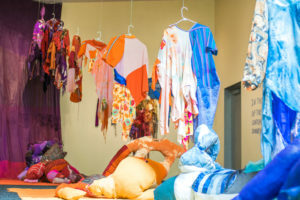 Every garment they create is formed through a process of “reactive collaboration” in which each artist can add to or subtract from the work with impunity before mailing it back. I cannot wait to see what they create next.